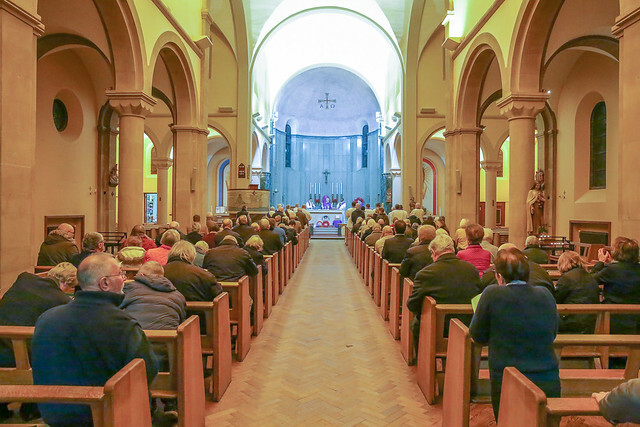 The annual Mass for deceased clergy of the Coventry Deanery was celebrated on Tuesday 13th November at 7pm. This year’s Mass was at the Precious Blood and All Souls Church, a Church dedicated to the memorial of those who died in the Great War. Fr Michael Brandon, Parish Priest, welcomed everybody saying that he had asked that the Mass was held here as part of the commemoration on the 100th anniversary of the signing of the Armistice as the church was dedicated to those who died. Many of the priests and deacons of the deanery were present along with representatives from all parishes. The Sermon was given by Fr David Gnosil, parish priest of Corpus Christi. “Today we come to remember the deceased clergy of the Coventry Deanery, in this Church dedicated to the Precious Blood and All Souls. "These two dedications form a beautiful union, partnership. The Precious Blood of our Saviour Jesus was poured out for us in atonement for our sins, to save us. "The Sacrifice of the Mass, the unblooded Sacrifice of Calvary which is shed daily on our altars is continually offered for the living and dead, the same intention of Christ the High Priest on Calvary. "During the month of November we remember in a special way the Holy Souls in Purgatory. "Maybe in the past Purgatory was seen as a place of Punishment, where really it should be seen as a place of Promise. "When we were Baptised we received a share with the Divine Life of God and became his adopted children. We were called by him. We were also called to be perfect as our heavenly Father is perfect (Matthew 5;48). "God has made us a promise, to be perfect as he is perfect. But what if that perfection is not completed by the time I die? Only that which is perfect may enter Heaven (Revelations 21:27). God has made me a promise and he never breaks his promises. "May the Lord who has begun this good work in you bring it to fulfilment (Phillipians 1:6) these are the words that a newly ordained priest hears from his Bishop on the day he is Ordained after he has promised a life of prayer, celibacy and obedience. "We are remembering in a special way the deceased clergy. To those who have been entrusted with a great deal, a great deal will be asked of them. None of us are perfect, and after 15 years of priesthood I see I have a long way to go, but God calls me as I am, warts and all. "I ask you to pray for your clergy living and dead. God has begun a good work and he never abandons what he has undertaken. Calling every Priest and layperson God has begun a Good work and he will bring it to perfection and burn away all attachment to sin whether in this world or the world to come, purgatory so that I may enter Heaven. I can't do it on my own, I am imperfect, I am only human. "But God the father through his Son's precious Blood will purify me of all attachment to sin, burn away all scares of sin so I may be perfect as he is perfect and so enter heaven to be with him for ever. Following Mass there were refreshments in the parish hall.